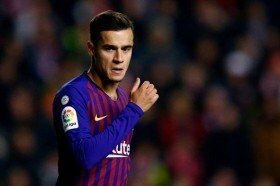 Manchester United boss Ole Gunnar Solskjaer has dismissed the speculation linking Philippe Coutinho with the club by stating that the midfielder remains a Barcelona player. The Brazil international made the switch to the Camp Nou from Liverpool at the start of 2018, but he has not made much of an impact on the club's proceedings in the league. As such, there has been speculation linking him with a potential return to the Premier League with the Blaugrana, but Ole has refused to comment on the transfer links with the attacker. "He's a Barcelona player. He's a Barcelona player," Solskjaer said in a press conference. United are set to face Barcelona in the second leg of their Champions League quarter-final at the Camp Nou. The Red Devils are currently trailing by a 1-0 scoreline after the first leg and they face a huge task of overturning the deficit. Barcelona did not produce the best of performances against United on the road, but they are regarded as favourites to progress, given they have remained unbeaten in the past 30 European games at home.